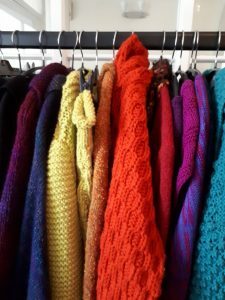 Where do I sell my Knitted Items? I was asked in the Facebook Machine Knitting group the other day…”Your photos are always the best! Wondering what you do with all the garments you make after photographing them?” Thankyou Alan Mross, great question! 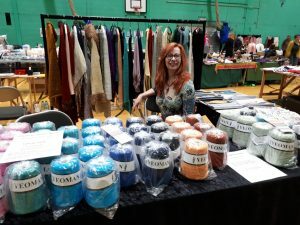 So I thought I’d share a few ideas on where I sell my knitted items – both offline and online from my own experience. 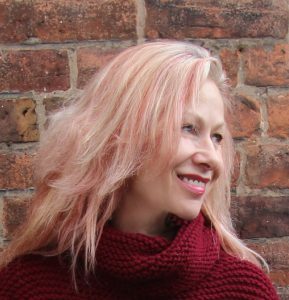 Obviously my pattern sales are where my business is at, but yes, Alan has a point…the garment has to be knitted in order to test the pattern and get some good shots for publication, but then what do I do with them?! There are lots of opportunities to consider, both on and offline. But here are a few that I have delved into for a number of years. For this one you need a good footfall! I have done craft fairs selling knitted items dating back to the 1980s when I first started with machine knitting and I can say that you get good ones, and dreadful ones!! Let’s discount the less than successful ones as they are pretty soul destroying and concentrate on how to find the good ones. 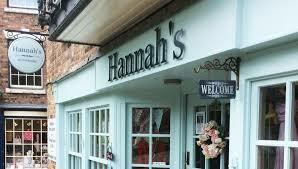 Google ‘craft fairs’ to find venues and dates in your local area or further afield. It depends how far you are willing to travel. Craft Fair calenders will give you dates and you will normally have to contact the event organiser for prices. You won’t have any trouble finding the fairs, but you should do some of your own research to find out footfall numbers and popularity of events. Obviously the larger the event, the more costly the stall. 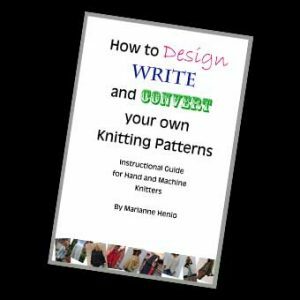 Take into consideration the area and venue as well when you are pricing your knitted items. You will get a different set of clientele depending on these considerations. Experience counts for something in this area of sales. But once you find a good fair, stick to returning next time. Do some research, ask for recommendations from those who have done the shows before. Visit some shows and talk to the stall holders. It can be a risky business if you go into this blindly, as I have found out to my cost in the past! These are normally on a smaller scale than craft fairs and might be just one-offs. They are probably going to be low cost and the stall cost will go towards the charity. The footfall depends on the marketing that has been done for the event by the organisers, as well as the chosen venue. I would also consider the time of year if selling knitted items and woolly stuff! Leading up to Christmas is probably the best time of year in the UK because of the likelihood of people wanting knits. Again, consider your market, demographics, and price accordingly. Oh yes! And make sure this event doesn’t clash with something more popular going on nearby at the same time! Etsy is huge now and the competition is high, especially with knitted items. Prices from designer to designer vary from rediculously cheap to very high. I would take all the advice that Etsy offer in marketing strategies. You need great photos of your stuff and find a way to stand out from the crowd. For minimal set up charges I’d certainly recommend it. Now here’s one that in the 1980s was probably my biggest pot of money. And if you do get a good client then please find all ways to keep them happy and keep hold of them. Some of my clients came from the days when I used to sell my knitwear by Party Plan (I’ll talk about that next). Building trust and a relationship and getting to know your client’s requirements goes a long way to getting future sales. This isn’t just the case offline, it is also true with online customers who you’ve never been in physical contact with before…a lot harder to create this kind of relationship, but very possible with social media and online platforms. I don’t do this any more but neverthless I still think it’s a great idea. 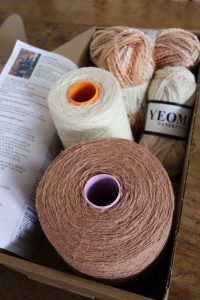 I started out with a bunch of designs, a rail, some colour cards, a good relationship with my local yarn supplier, and a willingness to knit in a client’s choice of colours and bespoke size. Was I mad you ask?! Probably! 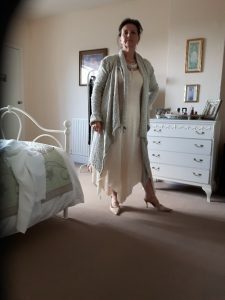 But you can tweak this down so it’s not so daunting…offer less choice of colour, or just offer standard sizing, for example. Each party host was offered a discount for holding the party. If they got more parties booked from theirs, they got extra discount! You just have to work out your profit margins and what you can afford to give away. I’ll mention retail next as I went on from doing Party Plan to opening my own retail shop. I’m talking offline retail here which is totally different to online. Unfortunately this enterprise wasn’t as successful as it might have been had I been a little wiser in business at the time. I was only in my early 20s and that’s my excuse and I’m sticking to it! Seriously though, retail is a big risky adventure and an awful lot of research has to be done first, especially if you are looking at opening up your own outlet. Too much to go into here. Maybe a safer place to start offering your knitted items for sale might be to look at local boutiques to see if they would sell your garments for you. Ok, you would not get the full sale price and you would have to come up with an agreement as to what percentage the boutique owner would take. But think about it…no overheads, nothing lost if you don’t sell, and you don’t have to do the marketing or the selling. I have some of my garments in a local boutique which doubles as a hairdressers. So her customers will often check what she’s got on her rails while having their hair done. I’m always on the lookout for other boutiques. As long as they like your stuff, agree on the pricing and they have the audience and a steady trickle of new garments, then it’s a win win I reckon. I’m going to mention Ebay as I’ve tried it out. I’ve never had any real joy with selling knitted items for what they are really worth though. There is such a lot of cheap apparel on the site that you are competing with. And let’s face it, that’s why this auction site was set up in the first place. So I won’t go any further with this one. Just thought it was worth a mention. So, these are the main areas that I have tested out with my garments. I’ve had some great sales and some equally bad experiences. I’m going to be offering more detailed tips down the line about my more profitable experiences, so keep your eyes open. Fast Fashion v Cottage Craft - What are we doing to our environment?